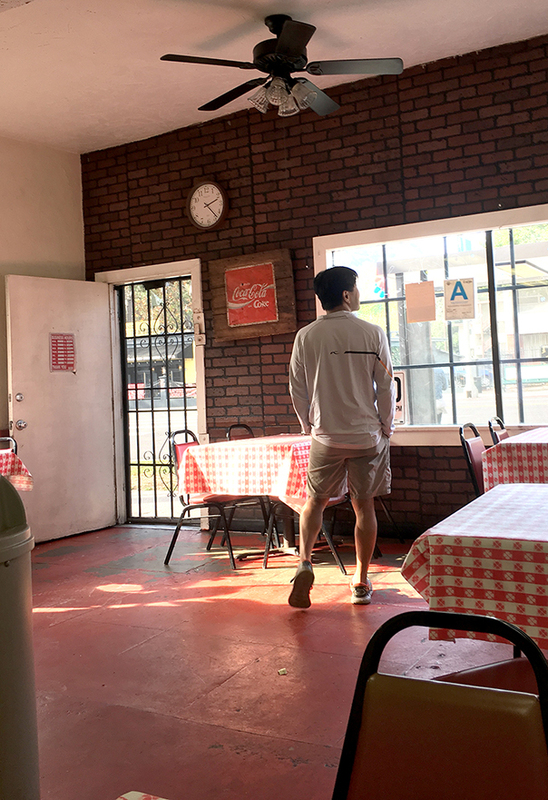 (1964) Giamela’s, Atwater Village | Remains of L.A.
-One big room, bright and airy, with a scuffed red floor and white ceiling, and seven tables, covered in those red-and-white-checked tablecloths, with straight-backed red chairs. Most of the walls are white plaster, but the wall with the door and the one big window is red brick. 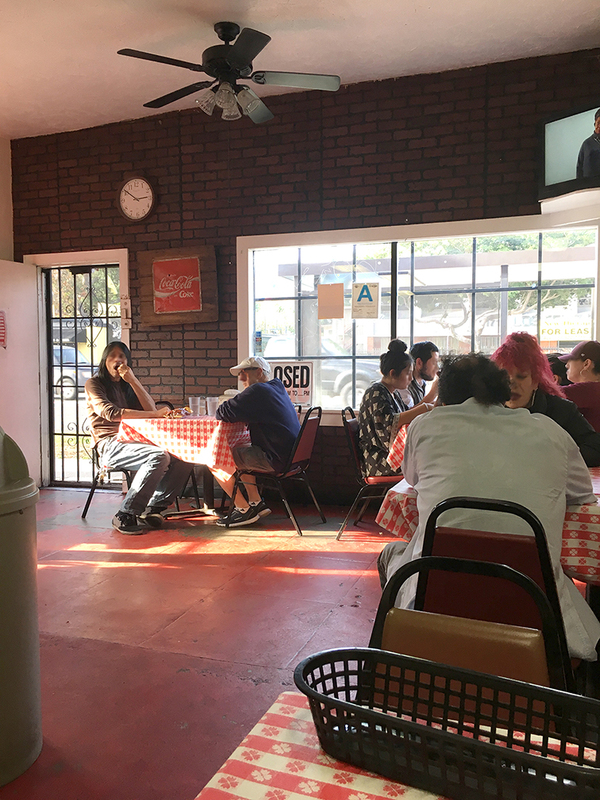 Directly across from the door is the counter where you order, with racks of chips to the right and a large orange-and-white sign on the wall listing all the different types of sandwiches and pastas and pizzas and things. Hanging from the ceiling over the counter is a sign that says, “Now Serving Snake River Farms Wagyu Beef for all our Pepper Steak Subs” plus a picture of the Instagram logo, I guess to remind people to Instagram their sandwich. 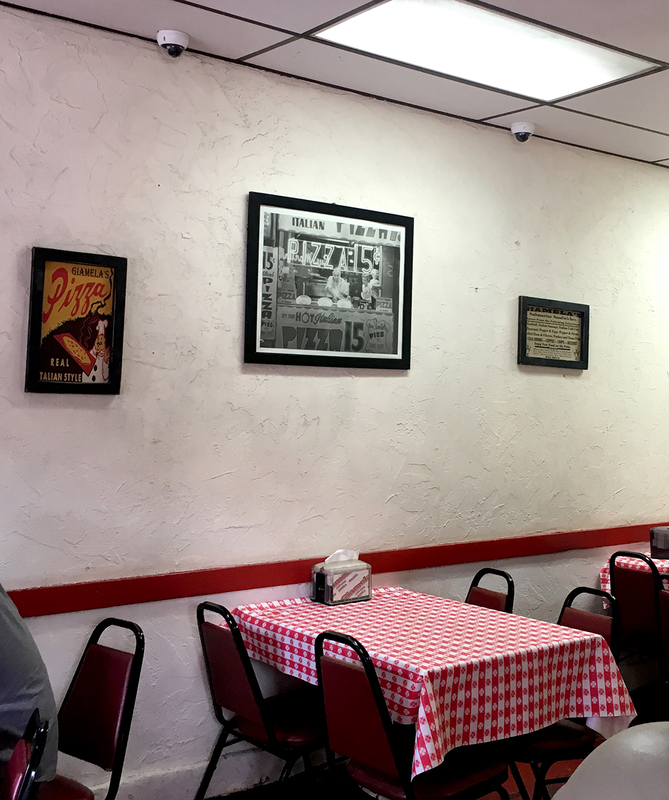 On the walls are framed pictures: a coca-cola sign; a large photo of the New York skyline; a couple of old Giamela’s ads; a photograph of an old-timey pizza place, probably in New York, with a guy serving pizza through a walk-up window (I liked that one a great deal); and nine framed snapshots of what seem to be Giamela’s being built and opened. On another wall are a couple old-fashioned ads for guns, one for Colt and one for Winchester. I wondered what made people choose these particular pictures. Was it done all at once, or as they were found? Did someone came running in saying “just look at these pictures of guns I got! They’ll be perfect for the walls at the restaurant!” These kind of one-room sandwich shops can go a number of different ways; some are cramped and dark and make you feel like you should just get your sandwich to go… but Giamela’s feels welcoming and nice and comfortable, the sort of place that anyone would want in their neighborhood. 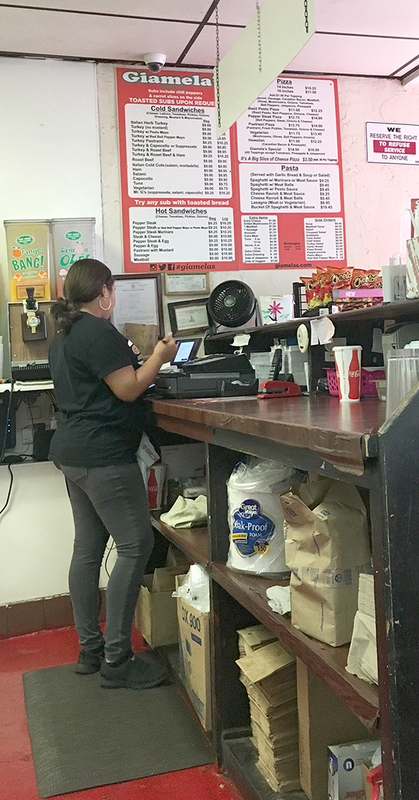 – I considered getting the special, which was a turkey pastrami sub, but the sign said you could get it with “pesto mayo or red bell pepper mayo” and that turned me off because I don’t care how special the mayo is, it should not be allowed in the same room as pastrami as far as I’m concerned. I got the meatball sub, which was fantastic and so huge I was able to take half of it home for David (my husband). I also got potato chips, and water to drink. -One wall was made of brick and we couldn’t decide if it was a real brick wall or not. Finally we knocked on it and no, it wasn’t real brick. But it looked so much like a real brick wall that we couldn’t tell until we knocked on it, so it may as well have been real, as far as prettiness and coziness go. -My sandwich was way too messy to just pick up and eat — I had to use a knife and fork, which is as it should be. I think if I ever find a meatball sandwich I can eat without a fork, it won’t be a very good meatball sandwich. But then I wonder if that’s not the opposite of the point of a sandwich. -When we got there, most of the tables were empty. There was a man and a woman sitting at a table near ours. They didn’t talk the entire time they were eating. The man got up and left about five minutes before the woman, again without a word. At the time I thought maybe it was just the worst blind date ever, or something. It didn’t occur to me until later that of course they were strangers; the tables were probably full when one of them came in and asked if they could share the table. Then the other tables emptied before I got there. I’m certain that was it, but at the time i was fascinated by the oddly silent couple, who apparently had still liked each other when they got sandwiches together but by the time the sandwiches were done were no longer speaking. -A guy in a baseball cap came in. He was… distractingly attractive. I enjoy being near attractive people as much as anyone, but it was seriously hard to have a conversation because I kept forgetting what I was talking about. He was the human version of those TVs that hang in restaurants and have shocking things flash across the screen so that the conversation keeps trailing off and the people not facing the TV get irritated at the people facing the TV. -There was a big pitcher of water on the counter, and cups, so people drinking water could help themselves. The pitcher was very full and very heavy and every time I got up to get more —I drink a lot of water — I was scared I was going to spill it everywhere. But I didn’t. -A little gray-and-white dog trotted in while the door was open. He sat down in the middle of the restaurant and looked around. He was fuzzy, and seemed extremely happy to be there. I thought maybe he was a stray, and came in because sometimes people gave him meat from their sandwiches. I thought maybe he really just wanted someone to take him home. Maybe I could do it. Maybe I could take him home and David (my husband) and I could convince our landlord that it would be okay for us to have a dog and then every day I’d come home and this dog would be there to greet me and I’d take him for walks and he’d sit in my lap while I wrote and I could name him Sandwich, or Meatball, or something like that, and we’d go everywhere together and at first I wouldn’t let him sleep on the bed but then I’d give in and when it was cold I’d have him wear little sweaters and make him the best costumes for Halloween and pet him all the time. Then a man came in and ordered a sandwich, and when he left with it he clucked his tongue and the dog followed him out. So I guess they were together. -There was a sign in the window that said “Closed.” I was confused by that because the restaurant was open. Of course I figured out pretty quickly that it said “open” on the other side and that was the side that people outside could see. I won’t tell you how long it took me. Not all that long. -My friend JT read aloud a bit from the book “Independent People” by Halldor Laxness, because she wanted me to hear this one passage about rain in Iceland. It made me think we should buy plane tickets and go to Iceland immediately. -A guy was waiting for his sandwich to be ready and when it was, he put his hands over his head and cheered. I like a person who can get that excited about a sandwich. -I spilled tomato sauce on my shirt. This is why I don’t understand people who go on trips with only two shirts in their suitcase, and then mix and match and get ten days of wear out of them. I ruin everything I wear by the end of the day. -An elderly lady came in; she had long, bright pink hair, huge hoop earrings, high heels with jeans, and a black top with a cut-out cleavage window. Her companion, drenched in cologne and with his hair greased back, was wearing a Scorpions t-shirt. It was easy to imagine them sixty years ago, dressed exactly the same way. I loved them so much. I wanted to sit with them and ask them their life stories, but they didn’t seem like people who would enjoy that, so I didn’t. – A steady stream of people in and out during the hour we were there. It was about half full when we came in, and then at one point we were the only people in the place, and when we left it was packed. It seemed about half people getting stuff to go and half people eating in. They were all glad to be there, it seemed like to me. What I Ate: Meatball sub, potato chips, water. Who I Ate With/Things We Talked About: JT, One Minute History; Bono’s smugness; handsome firefighters we have seen; those signs that say “We Reserve the Right to Refuse Service to Anyone” and whether they’re good because they potentially protect the waitstaff from harassment, or bad because they give the restauranteurs the ability to discriminate; Iceland. 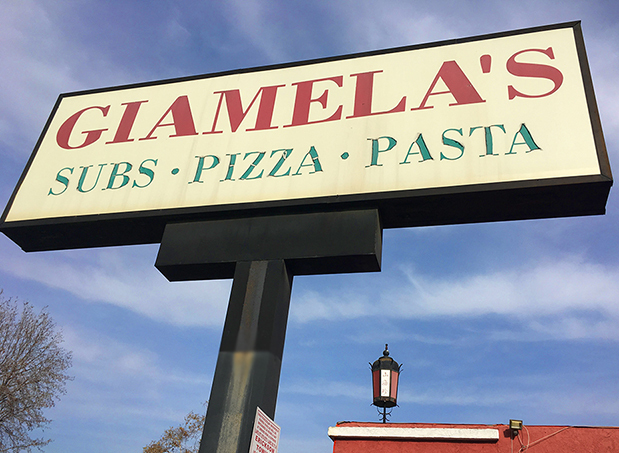 What Sort of Ghost I’d Expect to Find if I Believed in Ghosts Which I do Not: Two young men who came to Giamela’s for lunch every day the summer after high school ended. They’d grown up next door to each other, gone to school together, shared first date jitters and big game wins and losses, complained about teachers and chores and parents, faced challenges together and helped each other, shined their flashlights through their windows at night, sending messages in special blinking code, lived their whole lives side by side. When summer ended one of them was going to college and the other was joining the army, and they had no idea when they’d see each other again, or if they would. 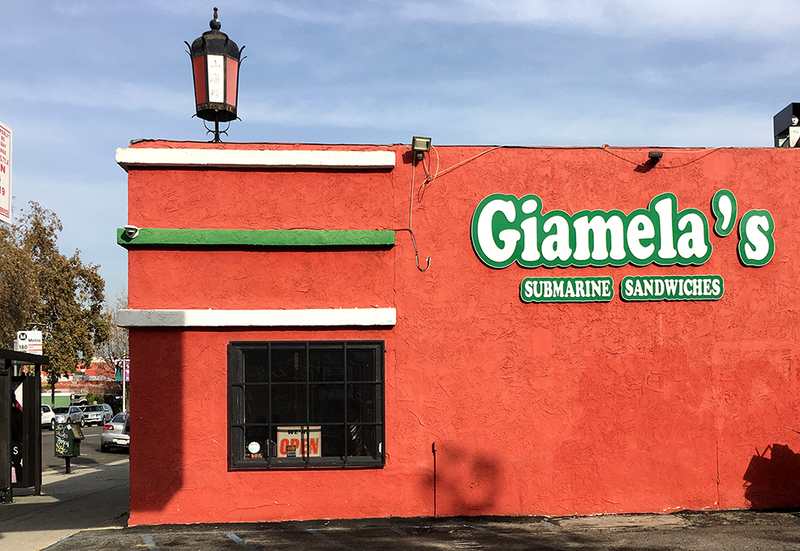 So every day that last summer they’d walk to Giamela’s for lunch, and eat sandwiches, and not talk about how much they were going miss each other. Now they sit at that same table, sit and don’t talk about how wonderful it is to be together again. Another great review/report. They used to have a location in Winnetka, that I went to a lot. Hey, you should do one on Taste Chicago in Burbank. https://tastechicago.biz/ It’s owned by Joe Mantegna and his wife. When I worked in Atwater , I’d get subs there from time to time. Always very good. I almost wish I still lived in SoCal so I could follow your trail. This is my kind of restaurant! …Have you been to the Knollwood, in Anaheim? I haven’t been to Knollwood yet, but will make a note to check it out! 30 years, since 1958. I grew up with their son. The real deal. Time capsule. 12808 Victory.